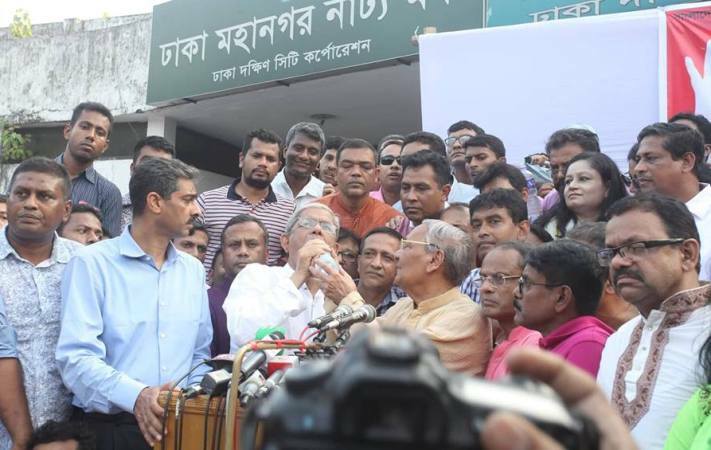 As part of its countrywide programme, BNP leaders and activists started observing a six-hour mass hunger strike in the city on Thursday, protesting the conviction of its chairperson Khaleda Zia in Zia Charitable Trust graft case. The protest programme began around 10am at Mohanagar Natya Mancha in the capital and it will continue till 4pm. Several hundred leaders and activists joined the programme amid tight vigilance by police. BNP senior leaders, including its secretary general Mirza Fakhrul Islam Alamgir, is scheduled to address the programme. Besides, the leaders of other political parties, pro-BNP intellectuals and professionals are likely to express their solidarity with the programme. Similar programmes are being observed in other districts and metropolitan cities. On Wednesday, the party formed human chains in the capital and elsewhere in the country while staged demonstrations on Tuesday. BNP senior joint secretary general Ruhul Kabir Rizvi on Monday announced a three-day countrywide programme, including formation of human chains, protesting the conviction of Khaleda Zia in the graft case. On Monday, a Dhaka court sentenced BNP chairperson Khaleda Zia and three others to seven years' rigorous imprisonment each in the much-talked-about graft case.